Episode #61: Year 1 Anniversary- Thank You! THANK YOU! We want to thank everyone for helping us throw down a successful and absolutely fun year of podcasting. It is hard to believe we have been doing this for a year and over 60 Episodes are in the books. We are also extremely excited for year 2 and all the fun things we have planned from the Ogden Trail Running Festival and all the guests we have been lining up to bring to you. We want to make sure you all know how much we truly appreciate the support -it means a lot to us and it makes us want to put out the best shows possible for you. Please make sure to participate in the contests for this show so we can give away lots of fun and cool prizes. 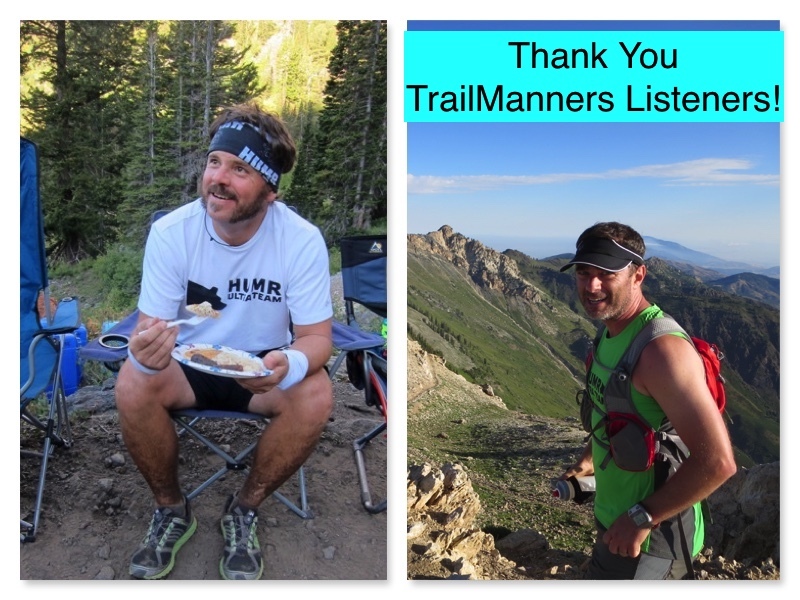 Thanks TrailManners listeners- you are the BEST and we are more than humbled. Congrats on a very impressive first years as podcasters. Love what you guys do. I’ve never lived west of Indy but have an appreciation for the west, especially when it comes to running. For part three of your contest, my recommendation for the coming year would be to include more interviews with first-timers — first time ultra runner, first-time 100-miler, first-time Hardrock competitor, etc. The interviews with elites are outstanding but mixing in some chats with these first-timers would be beneficial to those of us working toward similar goals. I agree with with first timers interviews! Thanks! Congratulations! I know that all of you worked really hard on this, and I have listened from the beginning! I can’t wait until the tickets go on sale for the fest! This is going to be EPIC! Thanks again for everything that you guys and your show does for our local and various running communities! Noooooooooooooo, I literally just bought tickets for Scotland a couple days ago leaving May 4th. I will be probably be running trails May 5th and/or 6th in Scotland, which is cool, but I will seriously miss the trail festival. This is what I get for purchasing plane tickets without consulting with Trail Manners first. Contest 2: My favorite line from any podcast so far was when you quoted Cory Reese from his book “If something is worth doing, do it now”…. That whole quote from that section of the book was awesome. Hits your right in the core. Contest 3: I’ve loved all your guests. I kinda like seeing a little more from average/back of the packers. Elites are awesome but it’s easier to identify with the mere mortals. Basically anyone with a compelling story no matter their level, will be awesome. Like I’d love to hear stories from people who maybe DNF’d a lot. We can learn so much from failure. If they later succeed that’s awesome too, but not necessary in my opinion. Mostly just keep the fun, cool, entertaining people coming (which is basically what you always have). And of course I love hearing from locals since I’m in Ogden. It’s fun when people I know are on your show. Hey, I am first! That’s a first! Love the shows with pros, but also like the shows with average folks. I am old (50) , so would enjoy hearing from masters runners. Like to hear reviews on any gear. As a flatland er, it would be cool to hear reviews of smaller, less known races, that an average guy can get in to. Oh hell, just keep talkin’! Good job guys! Wrong, we’ll atleast i podiumed. Doods. Congratulations on an awesome first year. This is so true. None of us DESERVE anything. The miles we ran today don’t care about the miles we ran yesterday or last year or whatever. You have to get out there and earn it. Every. Day. Congratulations on your first year guys! I truly hope you have many more to come. I only got into trail running a few months ago and that’s also about when I started listening to you guys. I have learned a lot from the 2 of you and your guests. Thanks for doing what you do! Contest 2: One line that has stuck with me over the last little bit was from Karl Meltzer on episode 56 “You certainly learn from your mistakes and that’s sort of how my world goes.” I’ve always believed this but to hear it from someone like Karl and especially regarding what must have been a couple of truly heart-rending setbacks made it even more real to me. Contest 3: I think it would be really cool to hear about races and trail running opportunities out in the Midwest. I live in Missouri but I’m from Idaho. Listening to all of the awesome places you guys talk about really makes me long to be back in the beautiful pine forests of the Northwest. But since that’s not currently an option it’d be really neat to hear what’s out in my neck of the woods. Thanks again, you guys rock! I loved “diamond days”. Since I am your biggest fan, you should pick me. Also, I think animal encounters would be a good topic or when people get lost and how they handle it. (I have been lost/bush whacking a lot, almost called search and rescue for a friend once) so hearing other stories would be great. I bet there are some great animal encounter stories out there, cool idea! I really love your show. Congrats on your one year anniversary! For contest 2: Any and every time you said “Squirrel’s Nut Butter.” It’s just funny. My idea is that you interview people while literally on a trail run. It may be raw, it may have some sketchy audio. But you guys are smart enough to make it interesting. Weather it is pressing record on voice memos on your phones or putting batteries in your recording equipment and hitting the trails, I think it would be new and fresh. It may take a few practice runs but I think it could work. Even building on the idea you could take your guest on trails you have never been on so us the listeners could hear the awe when you reach the view at the cliff of the mountain. Thanks for the year and many more to come.